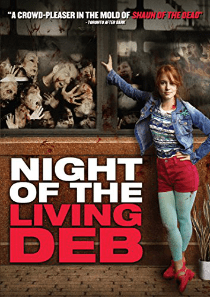 In Night of the Living Deb (2015), the super-awkward camerawoman, Deb Clarington (Maria Thayer of Forgetting Sarah Marshall and Hitch) wakes up on the Fourth of July in the bed of Ryan (Argo’s Michael Cassidy), the hottest guy in town. Not sure how she got there and not eager to leave, Deb doesn’t realize the turmoil brewing outside her door. Can Deb and Ryan escape the zombie apocalypse? Night of the Living Deb is the perfect Halloween date movie. It has something for everyone, romance, blood, intrigue and more than anything, humor. Deb is the bee buzzing next to your ear that you miss when she’s gone. She is quirky, awkward and endearing. Deb is the character who will come through and do the right thing, no matter what. As is natural in zombie films, when the outbreak becomes apparent (and both of the main characters are a bit obtuse), the first thought is to getting to family and making sure they’re safe. While I’m not sure that Cassidy is your classic “hottest guy in town,” both he and Thayer play their roles to perfection. Deb is the eternal optimist and the girl who is going to leave half her wardrobe at the house so that she has a reason to go back. Ryan instantly knows that their time together was a mistake and can’t get Deb out of his house fast enough. Turns out that Ryan is the son of Portland, Maine’s most powerful family. His girlfriend broke up with him the night before because he’s not the guy that wants to go into the family business. While Deb wants to make sure that her mom is okay, she agrees to get Ryan to his family’s home first, only to find his father (played by the brilliant Ray Wise who can currently be seen on ABC’s Fresh Off the Boat) is more involved in the apocalypse than anyone might have thought. While the ultimate goal is to save the ones they love, and romance doesn’t seem to be on the cards (or is it?). Deb and Ryan soon learn that they can count on each other. The zombie virus in Night of the Living Deb is unique in the way that it’s carried out to the populace and the way it behaves once infected. The delivery method and the behavior of the zombies once infected isn’t unique but is presented in a way that feels fresh as the characters have our understanding of what to expect from the undead. It may seem a strange comparison to those watching the movie, but there’s an Adventures-in-Babysitting feel to the movie leaving the children at home. Joan of Arcadia’s Christ Marquette plays Chaz, Ryan’s military-loving younger brother who sees the outbreak as his chance to prove his worth to the family and to his father who has always favored the more distant Ryan. Julie Brister of The Onion News Network plays Deb’s friend, Ruby, a Christmas store owning grab-life-by-the-balls kind of character that I would have liked to have seen developed further. If you’re looking for a funny and endearing horror film, pick Night of the Living Deb up today. If like me you need the occasional cheesy flick in your life, you will not be disappointed with this fun look at life after zombies.